The technology used in the application development relies upon a dedicated short range communication radio installed in the vehicle and on the roadway. This communication signal is fundamental in vehicle to infrastructure (V2I), vehicle to vehicle (V2V) and vehicle to pedestrian (V2X) communication. These radios transmit real time information that enables dozens of applications aimed at improving both safety and mobility. Sykes, a master’s degree candidate in the College of Engineering, worked with the Virginia Tech Transportation Institute’s Center for Technology Development to develop and test the application which informs participants of speed limits, high-occupancy vehicle lane information, lane availability, and traffic information. Sykes focused on learning whether drivers are interested in having this information, if it alters their driving behavior, and, most importantly, if the information is distracting. Sykes tested the application among 40 participants in Northern Virginia along traffic-laden Interstate 66 during high- and low-traffic times. Each study participant drove one of the institute’s highly instrumented vehicles along the Northern Virginia Connected-vehicle Test Bed, part of the Virginia Connected Corridors, for one to two hours using the application. Sykes designed the application to minimize distraction. To determine if drivers were distracted while using the application, video was taken of the participants while driving, and data reductionists from the Center for Data Reduction and Analysis Support assisted Sykes in analyzing the video footage. The reductionists measured how many collective seconds the participants looked at the application display instead of at the road. Participants were surveyed after each trip to gauge their opinions of the application. Finally, the video data were analyzed to determine whether the application produced changes in driver behavior. For example, if the driver was instructed by the application to take an exit to avoid traffic, the reductionists determined whether the driver followed those instructions. 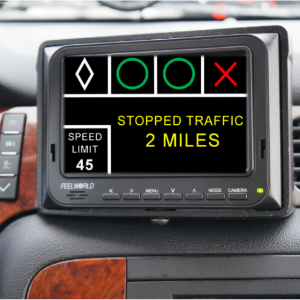 “Testing apps like this can save money because it can eliminate the need for large message signs along roadways since the information can be communicated inside the vehicle. It can reduce crashes and save lives in a number of different ways. For example, if someone uses a closed lane as a shoulder to pull over while other drivers use it as an open lane, it can cause a severe crash,” Sykes said. Sykes became interested in transportation after attending a Virginia Smart Road Open House. She was intrigued by the various capabilities of the test track facility and reached out to fellow student Alex Noble. Noble was the first student to participate in the Human Factors of Transportation Safety Graduate Certificate Program at Virginia Tech, and Sykes was one of six students to follow in the program’s inaugural year. Sykes hopes this project is the first of many she will participate in to help car manufacturers and federal regulators ensure that in-vehicle application development prioritizes safety. “Kayla is a great student and her project is among many others facilitated through the Connected Vehicle Infrastructure University Transportation Center which are helping us create innovative in-vehicle applications,” said Zac Doerzaph, who directs the Center for Advanced Automotive Research at the Virginia Tech Transportation Institute and is a member of Sykes’ advisory committee. The Connected Vehicle/Infrastructure University Transportation Center is a consortium that includes the Virginia Tech Transportation Institute, University of Virginia, Morgan State University, and the Virginia Department of Transportation. Learn more about the program online.